Use the tools below to help you decide if Bellevue College is a good fit for you. 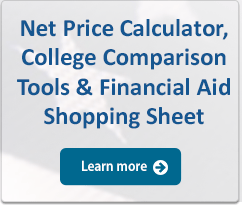 Net Price Calculator -The Net Price Calculator allows you to enter information about yourself to find out what students like you paid to attend Bellevue College in the previous year, after taking grants and scholarship aid into account. College Scorecard – College Scorecards make it easier for you to search for a college that is a good fit for you. Use the College Scorecard to find out more about affordability and value of colleges you are interested in attending. College Navigator –This college search engine produces information relevant to admissions statistics, retention, financial aid, and academics. It also gives you another way to compare schools, find schools in your area, and determine costs associated with attending those schools. Paying for College – Use this website to get help in making informed financial decisions about how to pay for college, understand financial aid offers, and student loan repayment options. Financial Aid Shopping Sheet -The Financial Aid Shopping Sheet is a tool used to notify students about their financial aid package. It is designed to simplify information about school costs and financial aid. Students who have applied for financial aid are able to create a Shopping Sheet using the Student Financial Aid Portal. If you have not applied for financial aid, but wish to access the Shopping Sheet, please contact the Financial Aid Office to ask that you be added to the Student Financial Aid Portal. Gainful Employment Information -Federal regulations require institutions to disclose to prospective students certain information about the institution’s Gainful Employment (GE) programs, and about students who enrolled in those programs eligible for Title IV funding that lead to gainful employment in a recognized occupation.